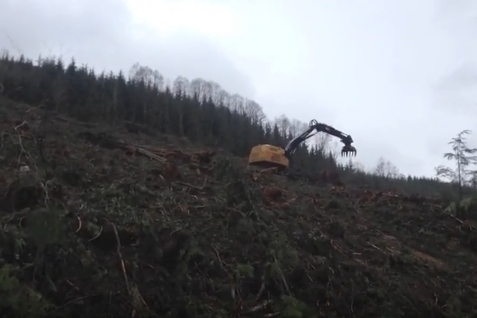 April 13, 2017 - Canadian Forest Industries spent a rainy April morning with DLind Contracting and Teal-Jones Group at a cut near Mission, B.C., where operators are often challenged by the steep ground and coastal terrain. DLind is one of Teal-Jones Group’s regular contractors, run by Dillon Lind. Lind’s father, Dave, started the contracting company in 1988 in Kelowna. He moved the business to the Fraser Valley about 10 years ago. DLind expanded significantly last year, which included hiring new operators and purchasing new equipment. Rob Ravai, vice-president of log supply and Fraser Valley operations for Teal-Jones Group, oversees about 500,000 m3. “This is very important to our business, we have to have timber supply in order to efficiently run our mills,” Ravai says. Look for a story on both companies in upcoming issues of Canadian Forest Industries.